Off to the Arc de Triomphe? See our inside advice for a queue free visit. We're also clued up on opening times and phone numbers too! Mornings tend to be less busy than afternoons. Think about booking your tickets online, especially if you’re coming during high season or french holidays (though we recommend also booking them in advance all year long, it’s never pleasant to wait 15-20 minutes). From 8:00pm to 10:00pm in December, people often queue in order to see the illuminations on the Champs Elysées. Reserve around 45 minutes to see the monument properly. Attention: last access to the monument is 45 minutes before closure. Attention: October 1st to March 31st, closing time is at 10:30pm. The high season (April 1st - September 30th) will obviously be busier than the rest of the year and the same can be said of peak hours. A drop-off area for people in a wheelchair is located to the West of the terrace. However, the lift only takes you to the attic room, which means you can’t get to the terrace unless you climb 46 steps after that room. From 1st April to 30th September: 10:00 to 23:00. From 1st October to 31st March: 10:00 to 22:30. 1st January, 1st May, 8th May (morning), 14th July (morning), 11th November (morning), 25th December. RER: Charles de Gaulle - Etoile (ligne A). 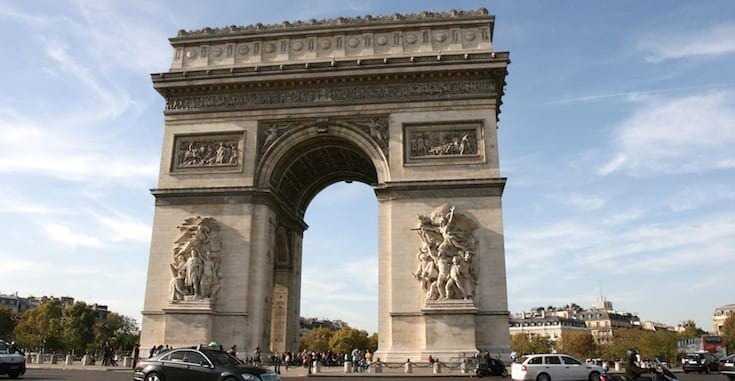 Feel free to comment or give your opinion on Arc de Triomphe. However, please agree to respect our terms. Please don’t post defamatory, insulting or disparaging comments- as we will have to moderate them. Instead, explain what happened in a factual way.